In 1940, when the bombs dropped on Bennett Road and Whitehawk Road, I was 13 years of age; I was living at No.7 Whitehawk Road. I remember the event very clearly and have a diary account of the occasion. The plane dive-bombed, and I was awakened by its screaming engine. Moments later came the screaming of the falling bombs and a cacophony of terrorised barking dogs. Was the bus garage the target? The plane was flying west to east, and it was a very poor effort for a diving, under-wing bomber, if the target was the gas works. The first bomb to strike the ground actually bounced of the pavement on the Clyde Arms corner of Princes Terrace and bounced into Bennett Road. The angle of the plane’s flight would have suggested that the Whitehawk bus garage was the likeliest target. If the target was the gas works, then the flight path was about 1/4 mile off target. On hindsight, I feel that he dived too low and had to release his load earlier than intended, and the low trajectory accounted for that first bomb bouncing. Thankfully, Rugby Place was never bombed. We lost part of the roof, all windows, parts of the upstairs ceilings, and door locks. All doors had been shut overnight, and the blast from the explosion in Whitehawk Road forced all the doors open. 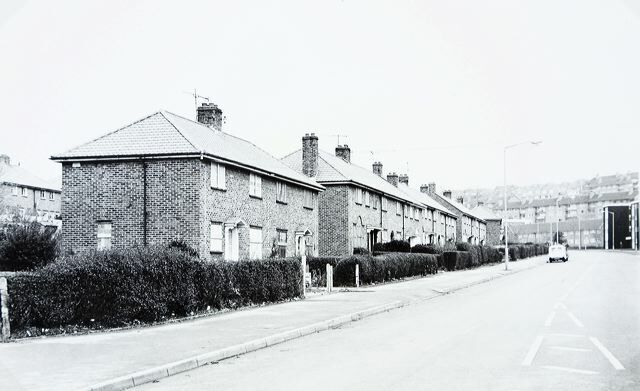 My Grandad lived in Whitehawk Road, roughly somewhere between the lampost and the van in the picture – almost opposite the bottom of Findon Road. Not sure exactly when he lived there, but I was born in 1960 and my Mum had been living there with him before I was born. I’m too young to remember the war, but I do remember my Dad telling me about the bomb in Whitehawk Road. When I was growing up, there was a lorry-park on the right- hand side as you went into Whitehawk, just before the flats.